"It's little things that mess up your life. Like the lingerie receipt your wife finds when you leave your suit out for the cleaners. Or the small lump of lead with the cupro-nickel jacket. If it hits you after leaving a gun barrel, it can change you forever." Paul T Lynch lists among his many careers and interests "musician, soldier, songwriter, voyager, photographer and writer". He is retired from the civil service and the Reserve Defence Forces, and lives in Killiney. 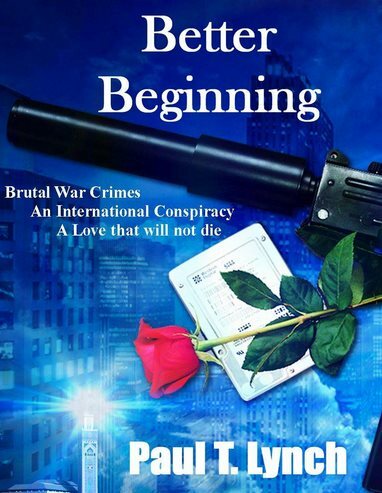 His globetrotting debut novel Better Beginning (2014) features a 62-year-old retired Irish civil servant and ex-special forces soldier. Dublin, September 2009. Gary Dunne is working for Europol to bring Serb war criminals to justice for the Srebrenica massacre. He becomes a target for Serbian war criminals, then his wife is murdered. Three years later, Dunne is persuaded out of retirement in Spain to go on the killers' trail. The quest takes him to Gibraltar, North Africa, Berlin and Athens.